Jamenda McCoy, owner of Belle Up, will open her third store on Aug. 15 in The Shops at North Bridge, also known as the Nordstrom building. Belle Up will be on the third floor of the River North shopping mall. 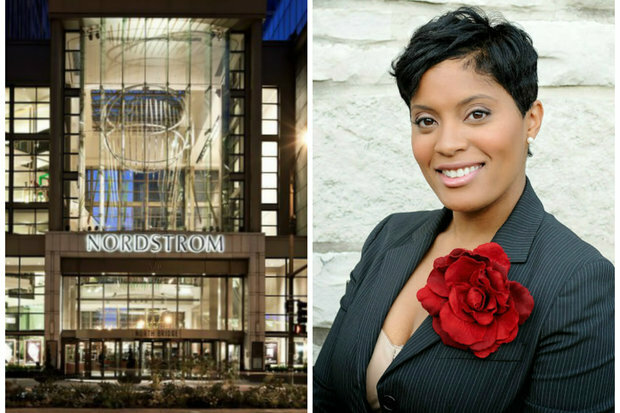 RIVER NORTH — Maternity mogul Jamenda McCoy will give birth her third store on Aug. 15. The owner of Belle Up, a maternity and women's clothing boutique, will host a soft opening from 10 a.m.-9 p.m. at The Shops at North Bridge. The 2,000-square-foot store will be on the third floor of the shopping mall fronted by Nordstrom at 520 N. Michigan Ave.
"I've been trying to take it all in stride," said McCoy, a Beverly resident. Indeed, it's been a busy time for Belle Up. The store moved from its original location in Mount Greenwood to a more quaint spot at 1915 W. 103rd St. in Beverly. The move to the shopping district near the busy Metra station was completed just ahead of Belle Up's fifth anniversary on Dec. 4. Belle Up quickly expanded with a pop-up store on April 1 at 1504 E. 53rd St. in Hyde Park. The lease for that location runs through January, but McCoy is hoping to make it a permanent shop. Word of the store's success piqued the interest of the leasing agent for the shopping mall on the Magnificent Mile. The agent visited the existing stores and pitched the idea of Belle Up becoming the sole maternity store in the Mag Mile mall, McCoy said. "Covering that category with professional women Downtown is important to us," said McCoy, who's also an attorney. McCoy opened her store as a result of her own frustration while pregnant with her two children. Struggling to find clothes to wear to court and on formal occasions, she recognized an opportunity for a high-end maternity clothing on the South Side. Belle Up added a line of nonmaternity clothing also known as its "mom's collection" in summer 2013. This line replaced some of the baby items as well as a selection of infant toys and other gifts. Mothers in the nearby neighborhoods embraced the addition of women's clothes, McCoy said. In fact, nonmaternity clothing now makes up about half of all attire at Belle Up. This split continues in Hyde Park and will also be the model in River North, McCoy said. She will have about six employees at the new store. In addition to carrying the same quality clothing, McCoy also expects to offer the same high level of customer service at her new store, she said. A grand opening celebration is planned from 10 a.m.-9 p.m. on Aug. 28. "2015 is our year, I think. But it all been fairly calculated. We are trying to fill some voids," she said.